This workshop will begin with a fully developed graphite drawing on paper, which will then be transferred to canvas. After establishing the value relationships with a mono-chomatic wipe-out, the painting will be fully developed in color. The painting process will be aided by a pallete, inspired by the Munsell-color-system. The same pose will be used for a total of 60 hours with the model. All steps of the portrait will be covered from the initial block-in to the final modeling of form. The physics of light on form will be discussed, as well as color theory. Portrait demonstrations by the instructor as well as individual critiques will guide the student through the process. Skill: An all levels workshop, from beginners to advanced artists. Students can also choose to work fully with graphite pencil for the two weeks. In this five-day workshop, artists will create a self-portrait painting from life using a mirror. Following a logical step-by-step approach, participants will first create an accurate drawing in graphite on paper, and then paint in oils on linen canvas or panel. Gregory will guide artists with daily demonstrations and in-depth personal critiques through each stage of the process – from creating a strong likeness with accurate drawing, to color mixing, modeling form and finishing details. Cranial anatomy, materials, paint handling, and the physics of light will also be discussed throughout each session. Beginning and advanced artists are welcome. Gregory will work with each artist to meet individual goals. 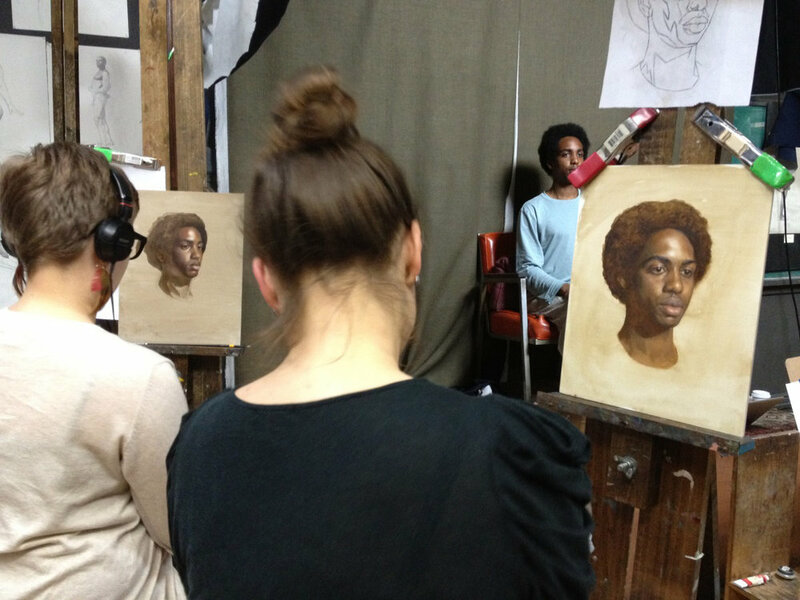 In this intensive five-day workshop, artists will create a portrait painting from life. Following a lucid step-by-step approach, participants will first create an accurate graphite drawing on paper, transfer the drawing and then paint in oils on canvas. Gregory will guide artists with daily demonstrations and in-depth personal critiques through each stage of the process – from creating a strong likeness with accurate drawing, to color mixing, modeling form and all of the finishing details. Cranial anatomy, materials, paint handling, color theory, and the physics of light will also be discussed throughout each session. Beginning and advanced artists are welcome. Gregory will work with each artist to meet individual goals. Supply list will be provided closer to the class time to students. As an alternative, we will have the option to order supplies at discounted retail and have them at the workshop when you arrive. More information is available to those who are registered. 10am-5pm daily with a 1 hour lunch break midday. In this studio, artists will learn the fundamentals of drawing and painting the portrait with an emphasis on accurate observation. The same model and pose will be worked on for a series of sessions as artists strive to capture the likeness of the model first in the linear block-in drawing and finally in modeling the effect of light over the form. Studies will begin with pencil on paper and move on to paint as participants demonstrate greater proficiency. Beginning to advanced artists are welcome.